Cellist Carlyn Kessler, whose performances have been praised as "stunning" (ClevelandClassical), enjoys a multifaceted career as a performer, educator, and arts administrator. 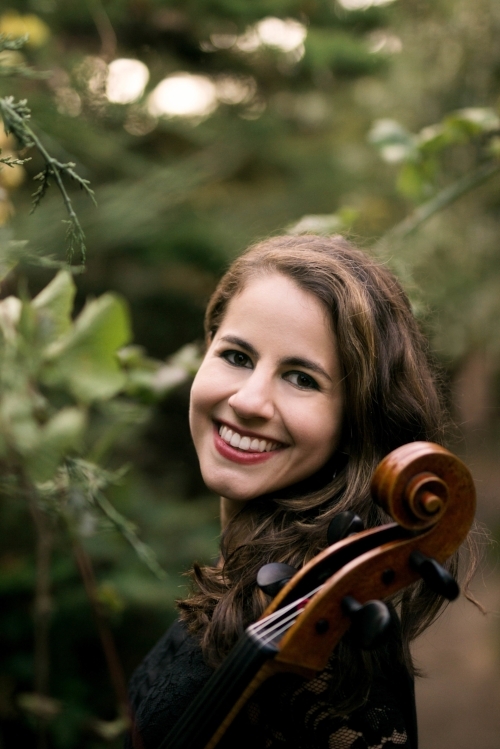 Currently based in San Francisco, Carlyn is a graduate of Cleveland Institute of Music, where she earned her Master of Music degree in Cello Performance and Suzuki Pedagogy and Bachelor of Music as a student of renowned performers and pedagogues Sharon Robinson and Melissa Kraut. Carlyn has performed across the country in venues ranging from Carnegie Hall to the Chautauqua Institution and Oracle Arena, as well as in Canada and England. A passionate chamber musician, Carlyn utilizes her love of chamber music through both international and local performances, education, and outreach. She was selected to be an Emerging Artist Fellow in Chamber Music Silicon Valley's 2018-2019 season, which includes numerous performances of seasoned and contemporary ensemble works. She is a newly appointed member of the San Francisco-based piano trio Curium, which specializes in the music of female composers and performs regularly throughout the Bay Area. Before relocating to San Francisco, Carlyn was a founding member of the Cleveland Cello Quartet, a genre-bending ensemble which was an Ensemble-In-Residence at The Music Settlement in Cleveland, OH. While at CIM, Carlyn was a member of the Advanced Piano Trio Program through which she performed in a weeklong residency with the Chamber Music Society of Detroit with the NOA Trio. She has participated in numerous summer music festivals including Mendocino Music Festival, Chamber Music Academy at Domaine Forget, Toronto Summer Music Festival, Banff Chamber Music Residency, Banff Master Classes and Festival Orchestra (where she served as principal cellist), the London Master Classes, Yellow Barn Young Artists Program, Meadowmount School of Music, and Bowdoin International Music Festival. Carlyn has performed with numerous orchestras including the Fresno Philharmonic, Stockton Symphony, CityMusic Cleveland Chamber Orchestra, Suburban Symphony Orchestra (principal cellist), Cleveland Opera Theater, and Banff Festival Orchestra/Opera Orchestra (served as principal cellist), and CIM Orchestra (served as principal cellist), among others. Carlyn has recently collaborated and performed with celebrated Classical artists Martin Beaver, Axel Strauss, Pekka Kuusisto, Steven Dann, Ernest Kovacek, Michael Gurevich, and Frank Morelli. She has played in master classes for Joel Krosnik, Philip Setzer, Jaime Laredo, Ani Kavafian, Ralph Kirshbaum, Donald Weilerstein, Gilbert Kalish, Bonnie Hampton, Colin Carr, and Noah Bendix-Balgley, among others. Carlyn has received several awards including the Stamford Symphony Jeniam Foundation Scholarship and Greenwich Symphony Orchestra Guild’s Dorothy Gluckmann Music Award. Equally passionate about Classical and popular music genres, Carlyn enjoys sharing her time between concert halls, stadiums, clubs, and recording studios. She has recently performed with popular artists Michael Bublé, David Silveira Garcia, The Texas Tenors, Brother Spellbinder, and Drenalin, among others. Carlyn is an active member of Classical Revolution, which brings classical music to nontraditional venues and festivals throughout the Bay Area. Carlyn loves sharing her music in healthcare settings (formerly a Cleveland Clinic Performing Artist), and she co-founded the Cleveland chapter of the national movement Groupmuse, a web-driven network that organizes informal classical music house concerts. Devoted to music education, Carlyn maintains a private cello studio in San Francisco and serves on the faculty of the Preparatory Music Program at Holy Names University. In Ohio, Carlyn was the Adjunct Professor of Cello at The College of Wooster and Department Head of Strings at The Music Settlement, a renowned community music school and large city hub for arts and culture. A passionate advocate for nonprofit arts organizations, Carlyn previously worked on the administrative staff of The Walden School, a nonprofit creative and experiential summer music school and festival. Also an avid writer, Carlyn publishes for San Francisco Classical Voice and formerly ClevelandClassical.com. Carlyn plays on a 2012 cello by William Whedbee.